This monte cristo salad is everything you love about the classic ham, swiss and turkey grilled cheese sandwich, this time in salad form! A perfect dinner salad, and also a way to use up any leftover Thanksgiving turkey or ham! This recipe for Monte Cristo salad is one of the ways I ease myself from the lazy hazy days of summer into the shorter crisper days of fall. It’s got all the scrumptious comfort food elements of my favorite grilled cheese sandwich…the ham and turkey, the Swiss cheese, the sweet taste of French toast…but in a lighter salad form. It’s like having one foot in summer and one in fall, lunch-wise. Let’s make it!This is the time of year when even though there are some summery temps here and there, you realize that your days of this are pretty much over for the season…. 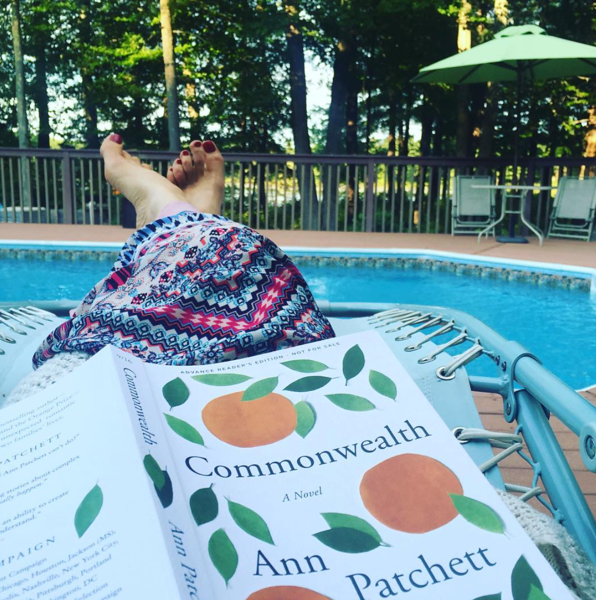 Side note: Ann Patchett is magical. MAGICAL. So these are the days that I transition us from our steady diet of grilled chicken and tomato salad and corn and basil everything into the warmer comfort foods of early fall. I’m not quite ready for the pumpkin storm, but not quite ready to give up my beloved dinner salads, and so this Monte Cristo salad is the perfect solution. This monte cristo salad is everything you love about the classic ham, swiss and turkey grilled cheese sandwich, this time in salad form!Click to TweetIf you aren’t familiar with the classic Monte Cristo sandwich that was the inspiration for this salad, it is a kicked up grilled cheese that features ham, turkey and Swiss cheese sandwiched between two pieces of French toasted bread. It is every bit as glorious as you think it is, and also, well, FILLING. My salad version keeps all those flavors, but lightens them up a little. 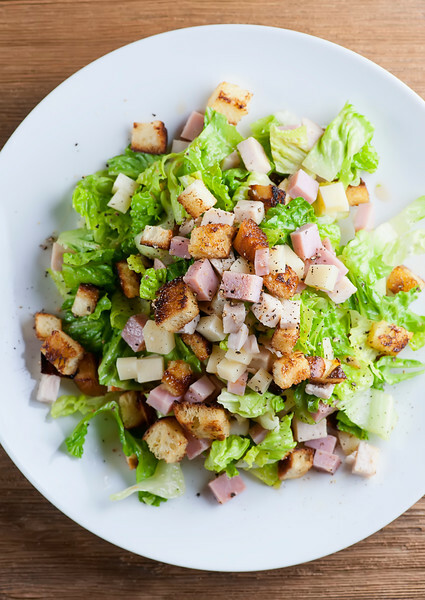 Little cubes of ham, turkey and Swiss cheese make up the basis of the salad. The sandwich bread is transformed into little French toast croutons. All that deliciousness is tossed with chopped romaine lettuce and a light maple syrup dressing. And while I will miss those lazy hazy days, a couple plates of Monte Cristo salad and my new fall boots, and I’ll be ready for the pumpkins! 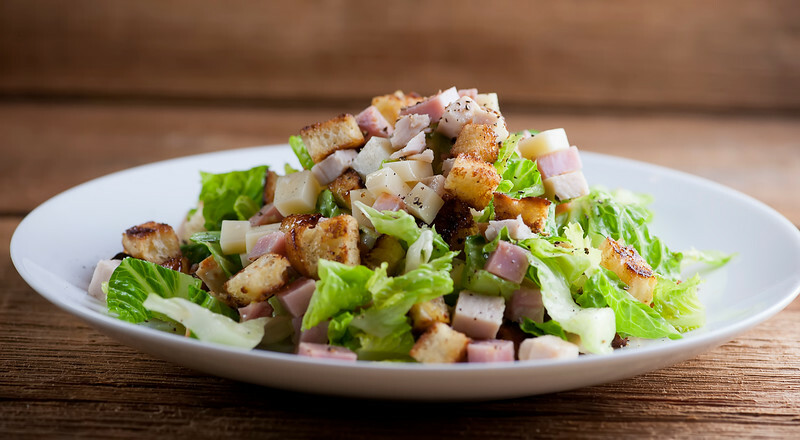 This monte cristo salad is everything you love about the classic ham, swiss and turkey grilled cheese sandwich, this time in salad form! Preheat oven to 375 and line a rimmed baking sheet with foil. Toss bread cubes with butter and sugar and spread in a single layer on baking sheet. Bake until golden and crispy, about 10 minutes. Put all dressing ingredients in a small jar, put top on securely and shake until well-combined. Put ham, turkey, cheese, lettuce and croutons in a bowl. Drizzle with dressing, toss and serve. I’m so with you, Autumn food is great but it’s a bit too early for pumpkin! I’m not ready to let go of Summer yet… Anyways, this looks delicious! Love the crunchy looking croutons, I can definitely see myself eating a salad like this :) Have a great week! Kate! That dressing sounds absolutely delicious and this is such a fantastic idea for a summer-to-fall transition salad ;-) I’ve always loved monte cristos, sometimes I even make them for breakfast! I miss summer, but I’m a teacher. So yeah, nothing in the world will reconcile me to getting less sleep. Still, you make beautiful salads that make the transition to fall a lot easier! Oh this is such a great salad combo, Kate! I love monte cristo sandwiches, so in salad form sounds even better. Such a fun twist! Kate, I just did this salad! Loved it! I used olive oil and did not add the sugar, to keep it more complian with my diat. But where the name Monte Cristo comes from? There is a famous 19 century book of Alexandre Dumas, a famous French writer, with this title: -) is it from there? The book talks about the South of France… so, I was wondering if this salad is from that region? Love salad recipes! This looks like a great one to try, thanks for the share! Oh my, I love everything about this salad Kate! Those challah croutons and that dressing! YUMMMM! This is a perfect salad to transition to fall! Not only that….but it’s just a perfect salad for anytime! I love all the flavors of ham, swiss cheese….and those little crunchy bits! Yum! Ann Patchett! I’m nerding out. I need to read that book. You have the most delicious looking salads. Who wouldn’t want this for lunch? There’s never a reason to have a boring old salad again! The Count of Monte Cristo was one of my favorite books when growing up, I must have read it at least 5 times… I never knew there was a sandwich or salad called like that. Sounds good, I like salads made with bread.